This week’s high-level hearing on the Monsanto Papers organised by the European Parliament is attracting a lot of attention. This is not to the liking of Brussels pesticide lobby group the European Crop Protection Assocation (ECPA), who have been organising last-minute lobby letters, a dinner and lunch to do some damage control vis à vis the multiple scandals that the Monsanto Papers have exposed. They have teamed up up with some of the national farmer unions and their representation in Brussels – COPA-COGECA. In an attempt to counterbalance Monsanto’s manipulations of the science, they’ve been using scaremongering tactics to scare farmers and politicians about the impacts of a ban on glyphosate-based weedkillers. For example, on the evening before the hearing, MEPs were treated to a luxury dinner in a restaurant located at a stone’s throw from the European Parliament. As a spicy detail, the restaurant is known for serving fresh, local and to a large extent organic food. The invitation that dropped on MEPs’ desks read: “Ahead of the joint hearing on Glyphosate by the Agriculture and Environment Committees on 11th October, we would like the opportunity to discuss the possible impact of a ban on Glyphosate could mean for EU agriculture sector”. The invitation comes from the Irish Farmers Association and the British Farm Bureau, “in partnership with the European Crop Protection Association (ECPA)”. 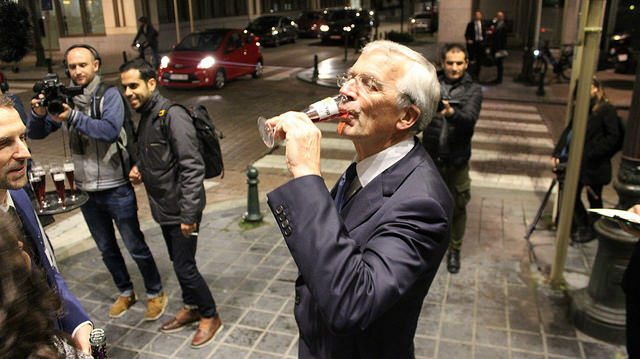 According to Politico, similar dinners have been organised for Dutch and French MEPs. MEPs accepting the invitation included the Brits Richard Ashworth (Conservative) and John Agnew (UKIP). 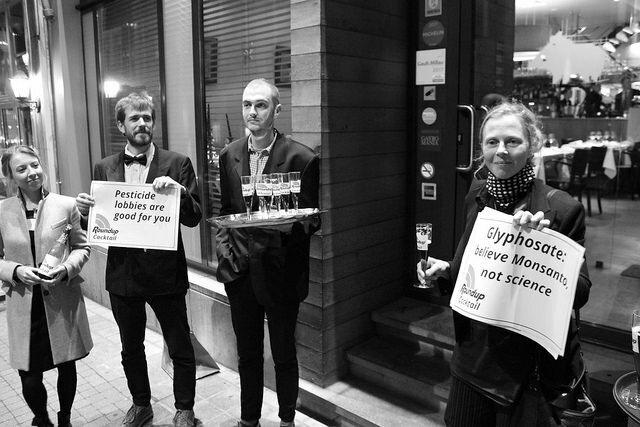 They and the pesticide lobbyists were welcomed by a group of concerned citizens (including from CEO) offering them a free "Roundup Cocktail". Agnew said to "thank God for Roundup" in the time he farmed, and since he was still alive it could not be harmful. According to him, it was all "stirred up by green groups". How the scientific opinion by IARC was stirred up by green groups was not get entirely clear. 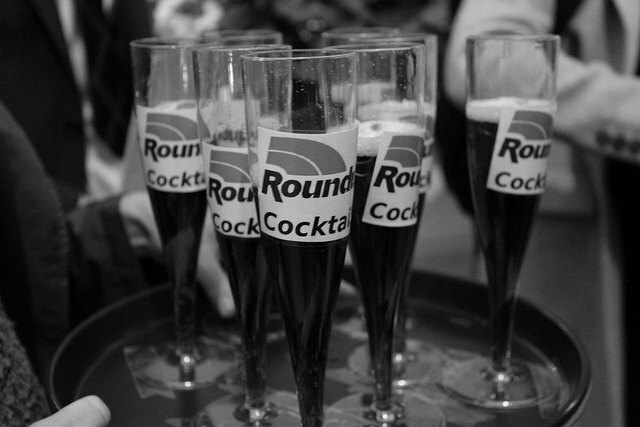 Ashworth readily accepted one of the Roundup Cocktails. When asked what questions he would pose to the scientists at the Monsanto Papers hearing, he said he hadn't made up his mind yet. To what extent will the ECPA lobby dinner inform his choice? In any case, Ashworth is very committed to keeping glyphosate-based weedkillers on the market. At the last Strasbourg session of the European Parliament early October he invited his colleagues to lunch for a “conversation about Glyphosate’s contribution to modern and sustainable agriculture and what the loss of this vital tool could mean for EU farmers, looking at a number of impact studies”. 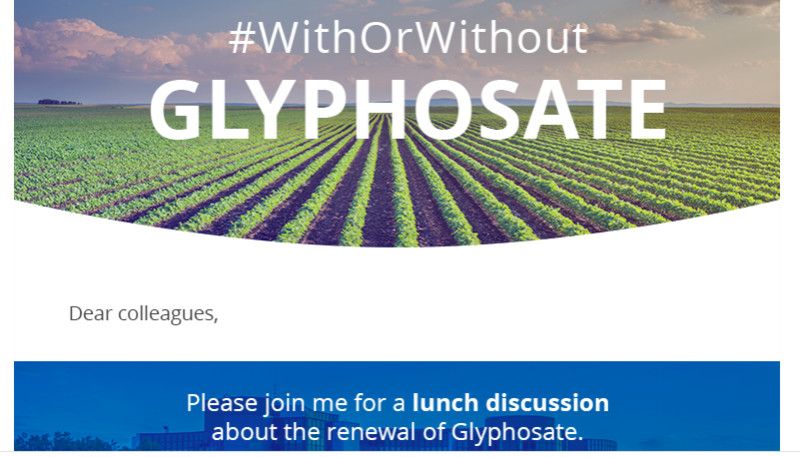 The invitation features ECPA’s campaign banner and slogan #WithOrWithout Glyphosate, but ECPA itself isn’t mentioned. It is not hard to see why the pesticide lobby is so keen to team up with the farmers' unions. The latter have unfortunately taken a very pro-pesticides stand, even though farmers themselves are also exposed to them, running health risks. Minutes obtained by Corporate Europe Observatory show how even the European Commission itself put pressure on farmers to become more vocal on glyphosate. The figures in a “study” used by the pesticide lobby ECPA and farmers unions to scare MEPs come to a large extent from .. themselves. Spring 2016: in the run up to a crucial vote on the re-licencing of glyphosate, DG SANTE (the European Commission DG for Health and Consumer Protection) feels unsure they will get enough support from Member States for their proposal to relicence glyphosate. Some of the national farmers unions accepted “.. that they were too silent in the past and need to be more pro-active in the future.” They complained that the current discussion on glyphosate is “political and no longer science based”, and asked the Commissioner “.. to ensure the continued approval with glyphosate even in the absence of support from a qualified majority of MS [Member States red.]”! The Commission answered that they “... broadly agreed” with the farmers’ unions and pressured them to lobby their own governments to support DG SANTE’s proposal (“..to focus on communications with relevant MS governments”), which was to give the green light for glyphosate’s licence for another ten years. In some countries indeed farmers’ unions got more active. Last 22 September, the french farmers’ union FNSEA mobilised 250 farmers to block the Champes Elysees in Paris, to protest against France’s commitment to say no to glyphosate. Their worries are understandable, which is why there is strong agreement that farmers should get support for moving away from Roundup and other pesticides. The pesticide lobby needed more dramatic figures to impress MEPs. ECPA has therefore delivered new “#WithOrWithout glyphosate factsheets” to MEPs’ post boxes, featuring dramatic figures of agricultural crop losses in case of a ban or phase out of glyphosate-based weedkillers in Europe. MEPs are told for instance that the Spanish olive harvest would drop by 20% if glyphosate were banned, Italy’s crop tomatoes would yield up to a million tonnes less, and French wheat and barley harvests would loose 7-15%! Says who? Says StuartRedQueen, a consultancy hired by ECPA. Where did this consultancy get its data? On page 7, listed on the top of “contributing parties”, are ECPA’s own members, pesticide lobby groups active in the countries represented in the report, such as the UIPP (France) and the British Crop Protection Association (CPA). Second on the list are COPA-COGECA member organisations in those countries: FNSEA in France, the National Farmers’ Union in the UK, the Deutsche Bauern Verband, etc. Finally, there are a number of other organisations active in the food supply chain and research institutes who have contributed. ECPA’s Public Affairs director Graeme Taylor to Members of European Parliament sent another last-minute letter on Monday 9 October. He calls on them to “not allow emotion to let us slowly sleep-walk in to a food production crisis in Europe” and to look at the “facts”, not at the bad reputation of just one company. His statement that “EFSA, ECHA and WHO have all said that glyphosate is safe” is entirely tailored to his his lobbying goal and a clear attempt to confuse MEPs. In reality, of course, the core scientific argument is precisely between EFSA and ECHA on one hand, and the World Health Organisation’s International Agency for Research on Cancer(IARC) on the other. What do the Monsanto Papers tell us about the EU re-licensing process for glyphosate, an ingredient of its best selling weedkiller Roundup? And what are the lessons we should draw about the general EU process to authorise pesticides and other risky products? These are the questions that are central to this week’s high-level hearing on the Monsanto Papers – the documents released following hundreds of lawsuits against Monsanto in the US. The hearing (live-stream here) is organised by two committees of the European Parliament: the Environment Committee and the Agriculture Committee. Corporate Europe Observatory’s Martin Pigeon is one of the seven people invited to speak at the hearing. Monsanto was also invited but refused, leading the European Parliament banning the company’s lobbyists from entering the building with lobby passes in an unprecedented move. For an industrial farming system, the ‘advantages’ of a broad-spectrum weedkiller like Roundup include: it is authorised in all EU countries, it has a wide range of uses, and it is cheap. This is why one of the key demands of the European Citizens Initiative on glyphosate, accepted a few days ago by the European Commission, is to support farmers in a transition away from pesticide use. Toxic free solutions for farmers to deal with weeds while saving the soil should be promoted. And last but not least, why can’t food markets be organised in a way that makes farmers world wide colleagues, not competitors? * See our story on the WHO/FAO JMPR opinion on glyphosate and conflicts of interest here.